I hope my story gives others hope as you can live a completely happy and fulfilling life even with OCD. My battle with Obsessive Compulsive Disorder started out like so many others. The earliest symptoms I can remember appeared around age 8. I had started to develop a prayer routine at night which, in my OCD mind, I believed would keep my loved ones safe. I felt I had to say my family member’s names 8 times, touch the right side of the wall after, blink 8 times after that and the list goes on. With so many rules and restrictions, I could not complete the prayer “perfectly” no matter how hard I tried. I vividly remember it was late at night and my mom was still up cleaning. I ran down to her and burst into tears because I could not get my prayers right and was so worried that my loved ones would be hurt because of this. This was the early 90’s and my parents had no knowledge of OCD. My mom brushed this off as a silly childhood quirk and was not at all alarmed that something more serious might be happening. Obsessions and compulsions continued on and off throughout my childhood and changed themes but usually fixated on my health and a fear of dying from AIDS, cancer, leukemia, appendicitis, a brain tumor, etc. My OCD was more just background noise while I was young but became stronger when I was getting ready to leave for college. For me, it seems that anytime I have a major transition in my life which involves a large change my OCD comes on full force. I have had two major episodes; one being going to college and the other being a relocation my husband and I made out of state for his job. With my first episode, I had heard bits and pieces here and there about OCD and figured I had it but so badly wanted to believe I did not. I compulsively asked my parents over and over whether I had OCD and if I was going crazy. Since I functioned fine and was a successful high school student, they assured my that everything was fine with me and that I did not have OCD. I even insisted on an appointment with my then pediatrician who was uneducated on OCD and as well assured me that I was fine. Once I got to college the stress leveled out and I was doing very well again. My second and by far most destructive episode came seven years later. At this point, I had completely forgotten about OCD and thought it was just some quirk and phase I went through when I was younger. A lot of stress happened to me in the span of a year; a breakup and makeup with my now husband, my grandma passed away, I got engaged, was looking at a possible relocation and trying to figure out a career. At some point this all came to a head and my long, lost friend OCD came back with a vengeance. Like all sufferers, this was a horrible time of anxiety for me that lasted a while. I lost a ton of weight, had a very hard time sleeping, could not concentrate on work, and was constantly seeking reassurance and barely functioning. My saving grace throughout all of this was finding Beyond OCD and coming into contact with its founder, Susan Richman. I was able to get in therapy and eventually on medication. My husband and I wound up relocating to Florida where I am continuing treatment and am doing much, much better! 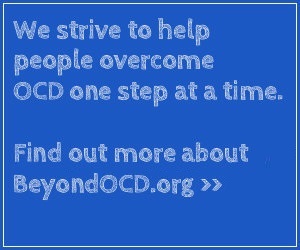 My testimonial for Beyond OCD is a long time coming because I thought that in order to share my story I had to have complete victory over OCD. The biggest lesson I have learned over the last year, and that Susan really helped me to accept, is that OCD is a disorder that I need to accept as part of my life for the long haul and continue to manage. For the periods of time when I am feeling well, and stress is low, I do just fine. When stress is higher I have my struggles but have learned to manage much better. I recently came off medication as my husband and I would like to start a family soon and have just begun therapy again so that I can stay on top of my OCD. I hope my story gives others hope as you can live a completely happy and fulfilling life even with OCD. I am living proof.